Excavate 3 genuine shark teeth just like a real paleontologist. Buried inside the shark tooth shaped digging brick shark-lovers will uncover 3 different species of shark teeth. This hands-on kit includes an excavation tool, brush, magnifying glass, full-color information guide, and an activity booklet with 10 fun games, puzzles, and challenges to complete. This is a must have gift for anyone who loves sharks. The genuine specimens in this kit are each millions of years old. This educational gift is a great way to start a fossil collection. Launch date: August 2012. Awards: 2012 Dr. Toy 100 Best Toys; 2012 Seal of Approval - Parent Tested, Parent Approved; 2012 Dr. Toy 10 Best Socially Responsible Products. 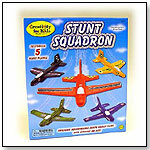 Customize this fleet of 5 durable foam planes with color-in stickers, markers, and metallic accents. The soft but tough foam bodies are easy to assemble and perfect for indoor or outdoor use. Wingspan measures 7". For ages 5 and up. 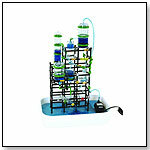 This set comes with a large tray and footing in which kids build the structure. The tray measures approximately 10 inches by 16 inches by 3 inches deep. The tray and the footing are both white. The footing has a grid of 12 holes for columns (4 x 3 configuration). Build the structure using the footing in the tray for the base, place the submersible pump in the tray, add water until it completely covers the inlet on the pump, and then enjoy reconfiguring the pipes, opening and closing valves and watching the action. When one takes the set down, all the parts pack into the tray, the plastic lid snaps on and it can be safely stored away for future use. Omnitrix Touch by BANDAI AMERICA INC. Simply touch the face to unlock the most technologically advanced Omnitrix ever created. The pop up touch pad allows kids to discover over 40 sounds and three separate modes of play. Mode one allows kids to hear 7 Alien voices, while mode two has ambient sounds that kids can overlay their own sound effects onto and create beats. Mode 3 allows them to replicate the DNA code found in other Ben 10 items to unlock secret messages from Azmuth, the creator of the Omnitrix. It's so easy to decorate ceramic beads with stickers. Just peel, stick and string. Includes 17 ceramic beads, 225 stickers, seed beads, 7 cords, ball chain, elastic, beading needle and easy instructions. nanoblock Statue of Liberty by OHIO ART CO.
You don’t have to be an engineer to create with nanoblock. With these micro-sized building blocks, 3D structures are constructed like never before. Watch as the beautiful Lady Liberty takes shape with over 700 assorted size and colored pieces. Includes detailed color instructions. Launch date: September 2012. — As of 10/01/2012 this product had 5 out of 5 stars from 1 review on Amazon.com. — Joe Berardoni Jr., owner of Puns Toys in Bryn Mawr, Pa., told TDmonthly in a Fall 2012 survey that nanoblocks are one of their top selling hobby items. — Rebecca Goblish, owner of Picayune Toys in Dunwoody, Ga., told TDmonthly in a May 2013 survey that for older kids, nanoblocks were her best-selling construction toy. Click It! puzzles take a traditional puzzle and blend it with today's popular technology. After completing the beautifully illustrated 24-piece "talk-about" puzzle, children can use any smart phone or tablet with a QR label reader application to "Click" the barcode and watch their puzzle come to life. The QR barcode will link them to a fun video animation of the puzzle that was just assembled. Additionally if kids flip the puzzle over, it becomes a fun coloring activity (crayons not included). 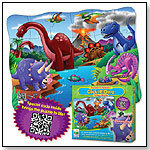 Click It puzzles offer the traditional ways of learning along with the high tech ways to discover. Each puzzle measures 24"X18". Launch date: 2012. Kids will be amazed as they watch their puzzle come alive with the Puzzle Double! Discover It! 3D Space floor puzzle. Taking the concept of a traditional puzzle to a new level, each Discover It! puzzle includes five fun, 3-D lenticular stickers. When kids finish piecing together the beautiful 30-piece, talk about puzzles, they simply add the stickers to their matching place in the scene and watch the puzzle come to life and move and change. Additionally, after assembling the puzzle you can turn it over for a fun coloring activity (crayons not included). Puzzle Doubles! Discover It! 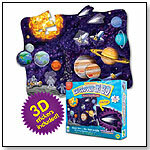 Space puzzle will provide children multi-dimensional ways to discover and learn. Launch date: 2012. 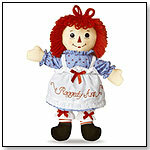 16" Raggedy Ann Classic - Large by AURORA WORLD INC. The original doll with a heart is back. Beautifully made with fine facial features in soft brown tones and yarn hair with the classic loop style. Has the traditional embroidered "I Love You" heart on her chest and features plastic button eyes. Viewing products 161—170 out of 1181 products.